Born July 4, 1947, in Spokane, Wash., Greg passed away suddenly on Oct. 13, 2015, in Half Moon Bay, Calif. Greg was a kind soul, very easygoing and friendly to all. He was full of great stories, enjoyed a good laugh and always had a big smile for everyone. Greg grew up milking the cows on a small farm where he developed a love for the outdoors. After graduating from Mead High School, he went on to earn a Bachelor of Arts in communications from Washington State University. He was a life member of the Sigma Phi Epsilon fraternity. During college, he served as an airman in the United States Air Force. He spent many years riding the railroads to visit family in Minnesota and worked as a crab and salmon fisherman in Alaska. 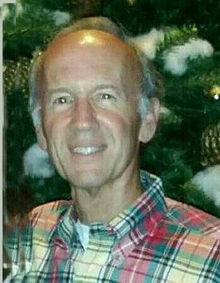 He was an avid camper and enjoyed fishing, sailing and traveling. Over the years he traveled the world and often vacationed in his favorite places in the Caribbean, Hawaii and Yosemite. He had his pilot's license for many years and enjoyed flying. Greg moved to the Coastside in the '70s and attended evening classes at the College of San Mateo where he met his wife, Ginny. Valentine's Day 2016 would have been their 40th wedding anniversary. They moved together from Montara to Half Moon Bay where they have been active in the community. Greg was a real estate broker on the coast for over 25 years and sold many people their homes. He acquired his Series 7 license and went on to sell securities and annuities. In recent years he enjoyed kayaking with friends and taking photos. He spent lots of time with his son's dog Drake and always had a love for animals. Greg is predeceased by his father, Louis Vincent Cowen, and his mother, Katherine Rose Fuller Cowen, of Sumner, Wash. He is survived by his wife, Virginia "Ginny" Sachse Cowen, and children Scott Gregory Cowen and Jenna Brooke Cowen, of Half Moon Bay, his brother Bruce Fuller Cowen (Barbara "Toobie" Ann Tabor) and children Kristine "KC" Ann Cowen Ficken (Brian) and Jeffrey Tabor Cowen, of Seattle. Services will be held at 11 a.m. Saturday, Oct. 24, 2015, at the Community United Methodist Church, 777 Miramontes St., in Half Moon Bay, Calif.
You will always be missed. I loved being able to have you as a part of my young life, and love your family. Rest In Peace. Greg we lost a wonderful and warm man when you passed. I am so grateful Dwayne and I were able to spend time with you last spring. Scott and Jenna will carry on with your warm and caring ways. We miss you. We couldn't ask for a better person to be our next door neighbor for over 10 years. Greg was one of the kindest and gentlest man I know. Greg will be missed by anyone who has ever met him. Greg's overwhelming kindness and infectious smile made such a positive impression on me as a kid when I first met him. That kindness and generosity will no doubt be his legacy as he passes it down to his children and everyone he has touched. Rest in peace Greg. Dear Greg, I've always admired your take on life; Your a classic man....your ability to be extremely funny, while also being so well mannered. There was always a sparkle in your eye and you always gave credibility and respect to other people's thoughts and opinions no matter their age, gender, or social class. You always asked how other people were doing and took time to listen. Your perception of the world was unique and respectable. Although it's been awhile, I'll always hold dear the conversations we had. What always stuck out and came across in your words was your deep desire to understand and care for your family. How lucky they are to have had you. Greg.... I must say 'A life well lived'. Love and condolences to the Cowen family.